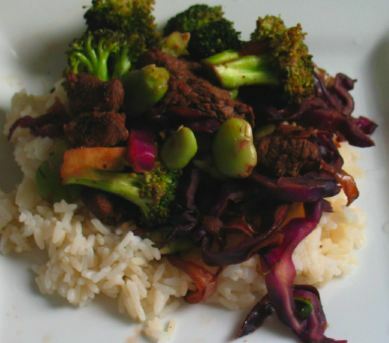 If adding beef, marinade it for at least 2 hours in 1 tablespoon of soy and the teaspoon of 5-spice. Add a couple of sprays of cooking oil to your wok, and put it on under a high heat. Add the onions and broccoli florets, stir occasionally cooking for 5 minutes. Next add the red cabbage, mix in the soy sauce and rice vinegar (if you didn’t make the marinade add the rest of the soy sauce and the Chinese 5-spice now). Cook for another 5 minutes. Add the beef now, and cook for 3 minutes, then add the broad beans for 2 minutes and serve.